With subversive wit and intellectual honesty, Lewis examines the events of his life that shaped his anti-authoritarian point of view and developed his comedic perspective. Growing up in 1950s suburbia when father knew best and there was a sitcom to prove it, he began to regard authority with a jaundiced eye at an early age. And as that sentiment grew stronger with each passing year, so did his ability to hone in on the absurd. True to form, he puts common sense above ideology and distills hilarious, biting commentary on all things politically and culturally relevant. ©2005 Lewis Black (P)2005 Simon & Schuster Inc. AUDIOWORKS is an imprint of Simon & Schuster Audio Division, Simon & Schuster, Inc. The autobiographical style of this book might disappoint those expecting the short barbs of Blacks usually cutting standup humor but it will delight book readers. Lewis Black takes the reader on a nostalgic journey through the times of his life with particular focus on the sixties and that decade?s influence on contemporary culture. There are many funny moments but mostly it contains a contemplative humor and anecdotes. This is a good book not a standup comedy album. Unlike the other reviewers I was pleasantly surprised by this book...I had expected another stand up routine (which would have been fine), instead I learned of his background through entertaining stories. I would not hesitate to recommend this book. This is not a bad chronicle of how Lewis Black came to acquire the cynicism and angst that drives his great comedy, but the book seems rather disjointed and lacking somehow. As I listened, I kept getting the feeling that he could have put a bit of the emotion that he shows in his comedy into the tales describing the events that made him become the person and entertainer that he is, but in the end the book left me somewhat disappointed. 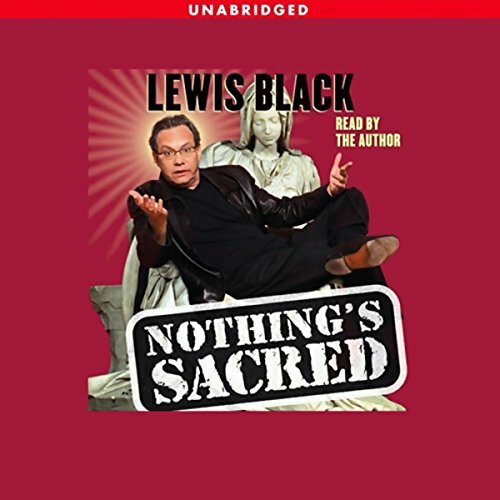 Even though this book doesn't contain the typical side-splitting humor that typically comprise Lewis Black's writing, I did like the stories he tells in this book. I am amazed, though, at the incredibly boring and even amateurish delivery he gives of his stories. For somebody who has (supposedly) studied theater and written many plays and monologues, Mr. Black does his own book a disservice. In fact, I found myself rethinking many of the lines once Mr. Black read them, trying to come up with the inflections and cantor the pieces so badly need. So, I like the content, but hope any second editions will be read by a more experienced narrator, like Shadoe Stevens or Homer Simpson. Here's my Lewis Black history: originally though he was a loud-mouthed hack of a comic who would deliver punch lines with all the subtly of a Mack truck. The louder the scream, the funnier it must be when the philosophy. But as time went on, I grew to enjoy his scathing sarcasm and increasingly looked forward to his stints on the Daily Show. I bought this audiobook with some anticipation. The book, however, contains very little of Black's humor and even less of his style and delivery. If you're interested in hearing how yet another comic/entertainer/person of note got to where they are today, by all means pick this one up. You'll get your fill of "growing up" stories and descriptions of a "summer in Europe". But don't expect to laugh. To answer your question Mr. Black, "Yes, you are funny but no, you cannot write funny." If you don't like his humor, you won't like the book. I love his humor and I enjoyed the book. It is not a series of his bits, although I remember hearing a couple on the Daily Show. Most of the book is about his life and how he came to think the way he does. I found it fun and entertaining. I even laughed out loud several times. it's more of a rant but without the comedy. 5+ hours gets a bit old. I really enjoy LB's stand up routines-- they are polished, tight, authentic and the timing is good. This book, on the other hand, reads like transcripts from LB's years in the therapist's couch. He is by turns angry, nostalgic, preachy, rambling, disjointed, self absorbed...I could go on. For my part, I would rather look at the Van Gogh painting then listen to what drove the artist cut his off his ear. He prepares the reader in advance for the truly profane moments, and the level of profanity does not disappoint. He does not prepare us for the hours of 'so what?' narrative that makes up the vast majority this 6 hour book. 'You had to be there,' a resolution that appears several times throughout the book, sometimes spoken, other times woefully obvious, is not a punch line. In fact it is the anti punch line. LB would have to agree that if that is the best closure you can give to a story, then shut the ___ up. Can't recommend this one. This book has the feel of a comedian who is out of material and spent, trying desperately to trade on waning popularity and revenue generating ability. I hope that is not the case. First, you have to be a fan of Lewis Black's sarcastic style. Second you cannot expect the non-stop manic delivery of his live show. His history is interesting and so is the perspective on the times that he shares. I enjoyed this audiobook but unlike other listeners I have heard the material before on his Live On Broadway DVD. Now that I have both, I'll go back to the DVD, because in my opinion this is how Mr. Black is best, dark sarcastic and manic. Don't expect his Daily Show musings. It's just a biography. And if a biography of great people are sometimes boring, you need only imagine the drudgery to befall you after listening to this.